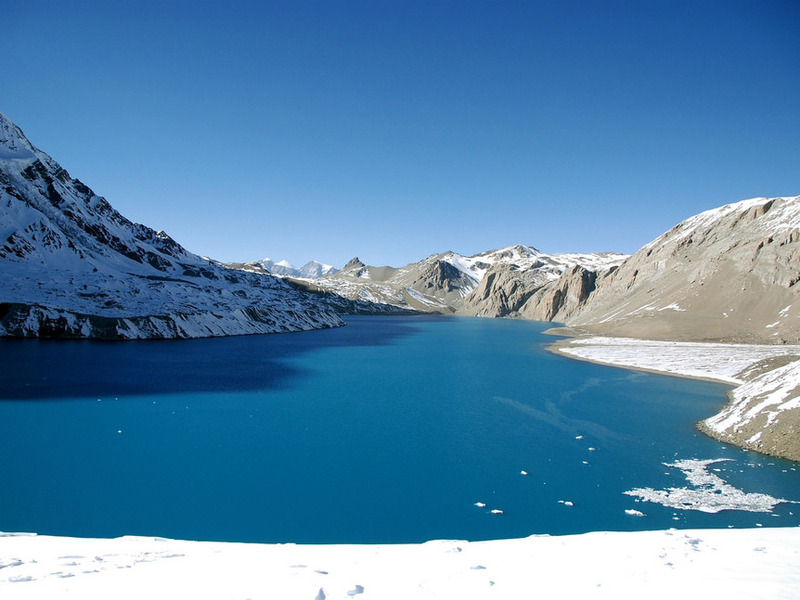 With the Tilicho Lake Trek you trek all around the Annapurna Circuit via Tilicho Lake (4920m) and Thorong La (5416m). 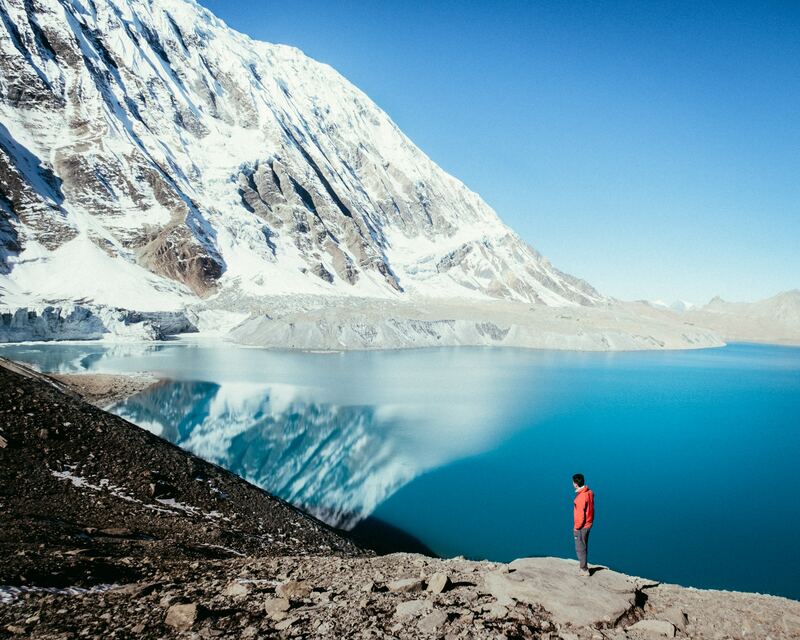 The lake collects the glacial melt of the entire northern slopes of Annapurna and the Thorong Peak. People even claim that this is both a holy and the highest lake in the world. This trek is a real adventure. Because you get to see a variety of mountain landscapes and traditional, local cultures at the same time. With this trek, you will go all the way to Khanshar Village, in a high and remote valley. 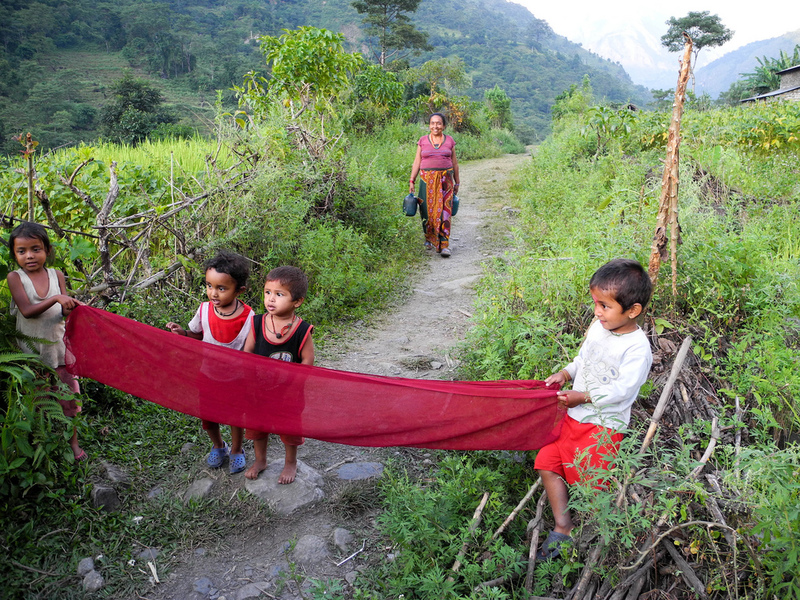 People call this village ‘The Last Village of Nepal’. All about the Tilicho Lake Trek [Thorong La]. Your Tilicho Lake Trek starts in Besi Sahar from where we follow the river Marshyangdi uphill. Along the way, we have great views of Manaslu and Himal Chuli to the east. This magnificent trek leads you via fine villages habited by a wide diversity of people from different ethnic groups. This route is basically the same as our Annapurna Circuit Trek. 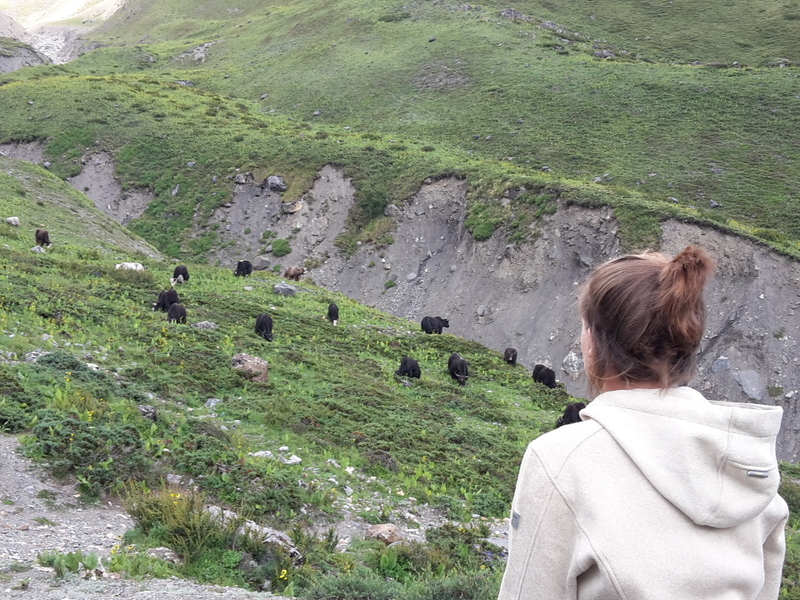 However, from Manang we take the valley north to Tanki Manang and Yak Kharka. All the way to the main valley to the west, to Khanshar Village. 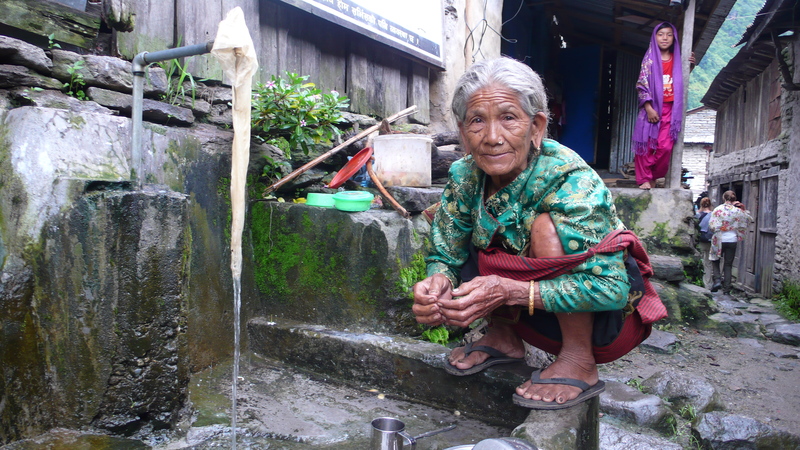 People call this village ‘The Last Village of Nepal’. 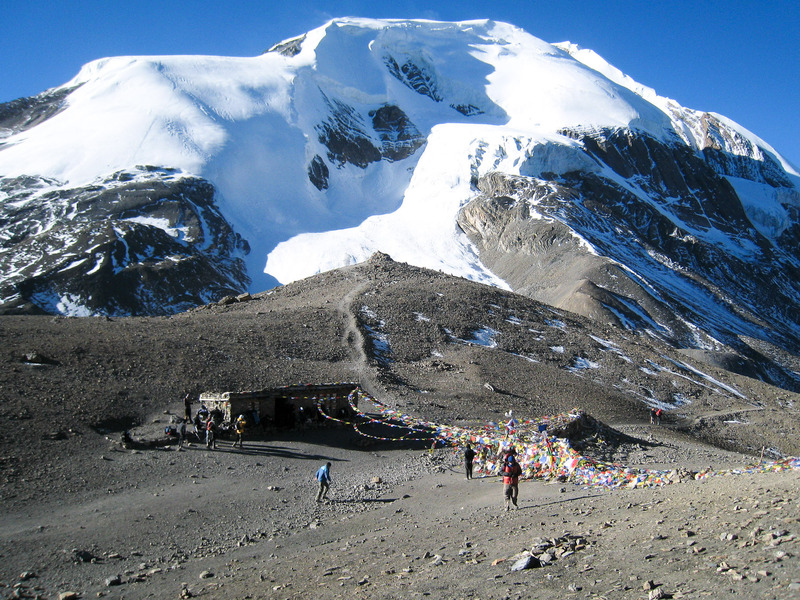 Then we trek up to Tilicho Lake, to Yak Kharka and over one of the highest passes of the world: Thorong La (5416m). From Thorong La, the trail leads us down to the holy pilgrimage town of Muktinath. 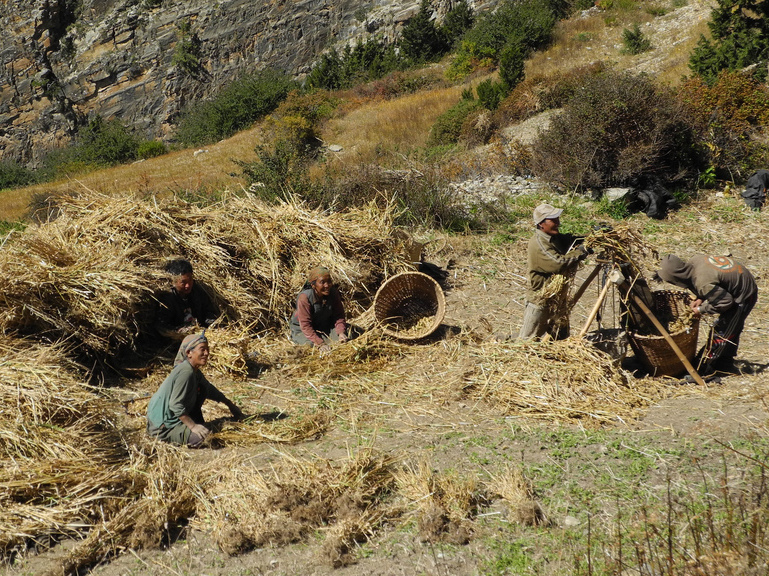 On the last day, we trek via a mountain desert in Mustang to Jomsom. Here we get on a small plane that takes us back to Pokhara in 35 scenic minutes. 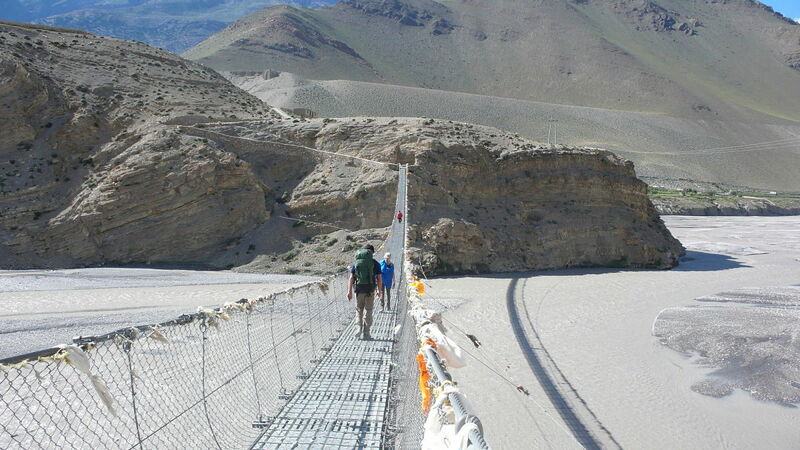 You could also consider the 19-days Annapurna Circuit Trek, via Thorong La as well. 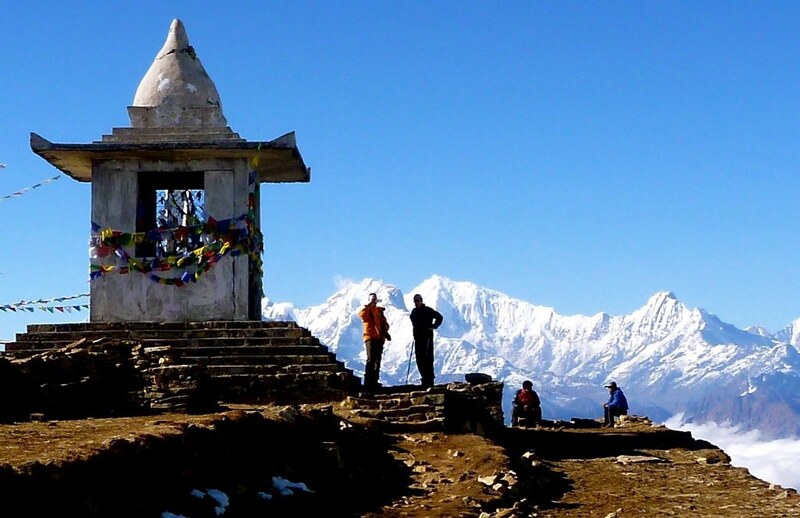 With this route you trek all around the Annapurna mountain range. You get to see the mountain range from all different sides; from the east, to the north, to the west and then the south. Your mountain guide (and porter) arrives at your hotel at 7am in the morning to pick you up. After a 7/8 hour drive you’ll reach Besi Sahar (760m) where you spend the night. Today your journey really begins! 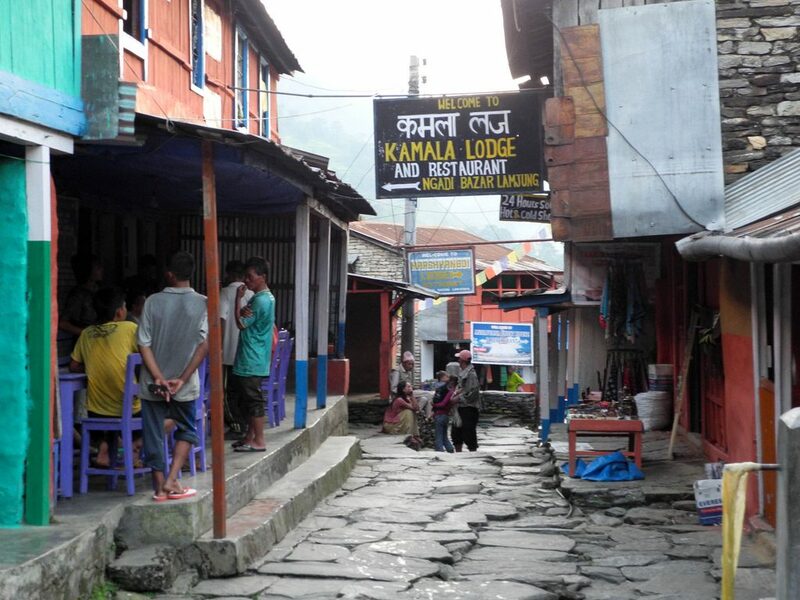 You start walking from Besi Sahar where the trail makes a climb to Khudi (790m), the first Gurung village. Interesting to know is that many of the famous Nepalese Gurkha soldiers are Gurungs. When you continue from Khudi, the trail offers fine views of Himalchuli and Peak 29 (Ngadi Chuli). 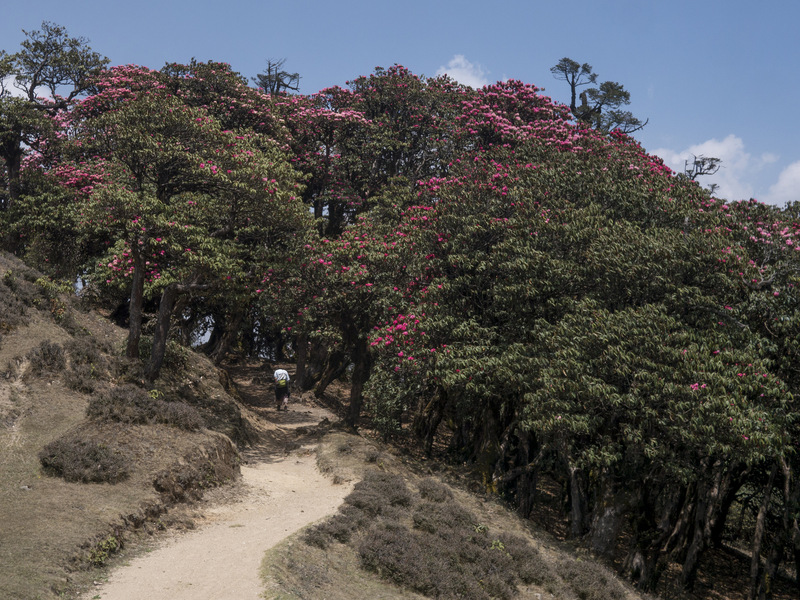 You climb to Bhulbhule (825m) and then via Ngadi to Lampata nearby Bahundanda (1310m). Today, you begin the day by following a steep trail down to Syange (1070m). On the way, depending on the season, you can see a large waterfall. After crossing the Marsyangdi river via a suspension bridge, you walk along the river to the stone village of Jagat before you climb through the forest to Chamje (1410m). Now the day begins with a rocky trail uphill along the Marsyandi river all the way to Tal (1675m). This village in a wide, flat valley is the first in the district of Manang. From here our trek continues up and down to Dharapani (1890m). When we approach Bagarchhap (2160m) we can see the typical Tibetan flat roofed stone houses surrounded by apple orchards and maize fields. Up to Tyanja (2360m) we climb, from there we continue through the forest near the river to Kopar (2590m). As we reach Chame, the headquarters of the Manang district, we are rewarded by fine views of Annapurna II. This town has two hot springs where you can soak and relax yourselves from the trekking so far. Along this route you’re introduced to a local community of which the residents migrated from Tibet centuries ago. After acclimatizing at Manang we continue our adventure towards Tilicho Lake! 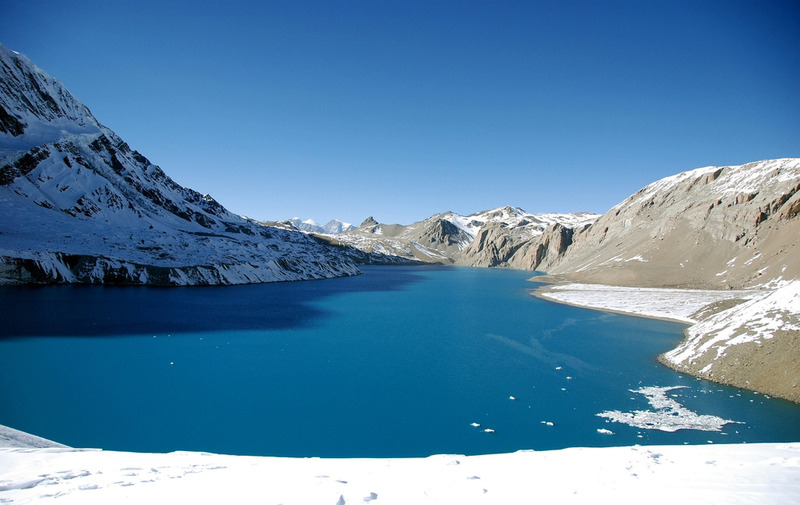 The lake is situated on the west end of Manang following the path down to the river. After crossing Khangsar Khola we reach Khangsar and head towards the village region. 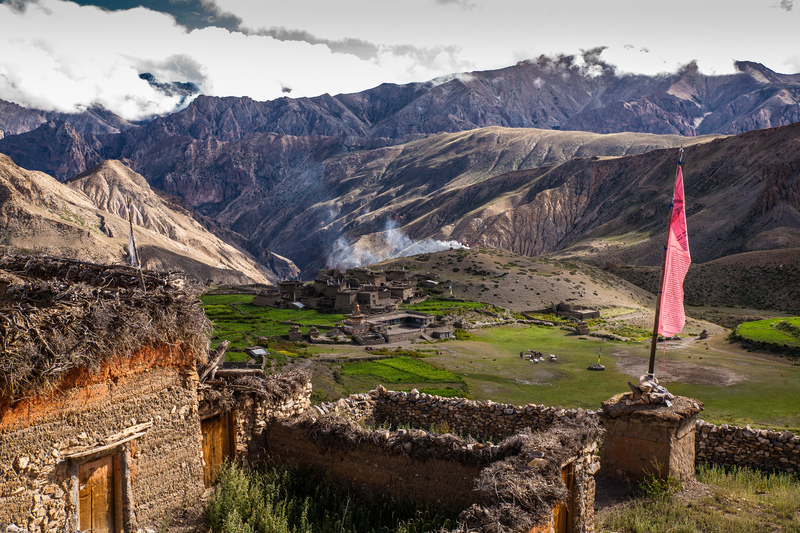 This area is still very traditionally Tibetan and known as the Last Village of Nepal. Today we trek via a large path and pass a Gompa, a Buddhist monastery. The route ahead follows a quite new path up towards a high ridge and meets an intersection. One path maintains the altitude, traversing the slopes towards a place where the valley is narrow. The other continues to ascend towards the line of the ridge. The original path is very old, and is much more difficult as it goes on really steep screed. The second path is the new one that goes a completely different way. We follow the new path, where we reach a high crest and descend on switch backs carved out through the screed slopes to a side valley of the main valley. At its bottom is a brook which we cross to the building on the other side that is known as Tilicho Base Camp (4200m). Today we go to Tilicho Lake! The day begins very early in the morning at around 6am as we try to avoid the wind. From Basecamp to Tilicho lake takes another 3 to 4 hours. Tilicho Lake, claimed as highest lake of the world, is a cold barren place in the afternoon. After spending some time around Tilicho Lake we return the same way back to Basecamp as there are no any accommodation facilities at Tilicho Lake (4920m). Today we trek down to Kagbeni and then follow the Kali Gandaki river to Jomsom (2720m). Jomsom is a large town with many facilities, it is also headquarter and official town for whole Mustang district where all the district government offices are present. Today we wake up early for the 30-minute morning flight that takes us to Pokhara. From Pokhara airport we drive to the hotel. In Kathmandu and in Pokhara, before and after your Tilicho Lake trek, you will be staying at a 3-star hotel with a private bathroom and wifi. These hotels have a prime location. In Kathmandu you will be staying in the travellers neighbourhood Thamel. And in Pokhara you will be staying in Lakeside. Both hotels are nearby many restaurants, trekking gear shops and supermarkets. 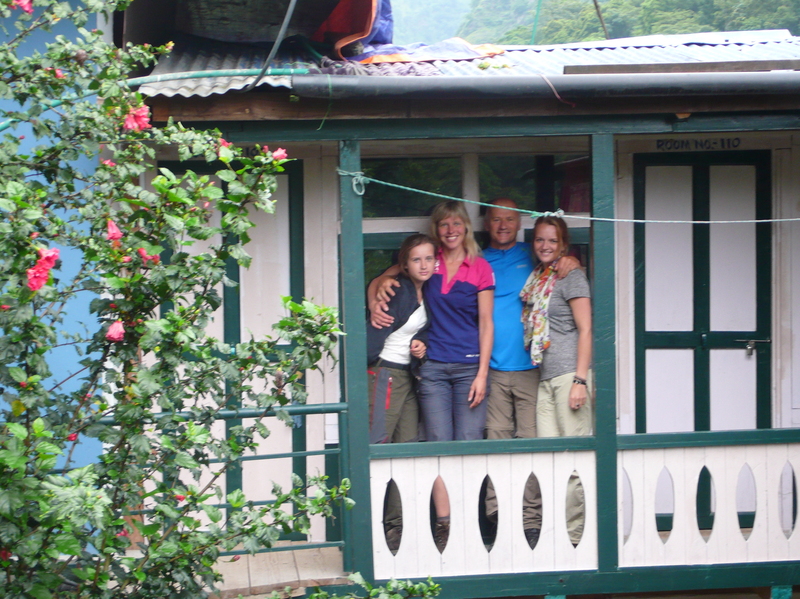 During your Tilicho Lake trek, you will be staying at basic mountain lodges. Here are double rooms and shared bathrooms. Tilicho Lake by Wangpin T.
Miri in Muktinath by Charlie C.